Welcome to the first established church in Lake Geneva. We are a United Church of Christ parish. The UCC is one of the most diverse Christian churches in the United States. Our motto — "that they may all be one" — is Jesus’ prayer for the unity of the church. 2014 marked the celebration of our 175th year!! The founders of this church in 1839 were moved by a genuine desire to "lay the foundation of a strong and influential church, from which good might radiate through the whole community...." Their faith, vision and goal continue to remain a challenge to this church for each succeeding generation. It was the Home Missionary Society that gave partial support to that small body of believers for the first thirteen years of life in the, then, frontier town of Lake Geneva; thus assisting it through its embryonic growth. It was formed in 1839 as the First Presbyterian Church. 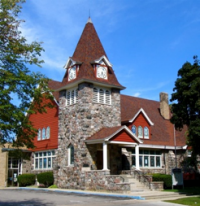 In 1883, the name was changed to First Congregational Church of Lake Geneva. Two wood frame buildings preceded the current stone structure, which was built in 1897. The pipe organ and Seth Thomas Clock/Chimes were installed during the 1897 project. Stained glass windows have been added over the years, many as memorials to community pioneers. Due to a denominational merger in 1957, the name was changed to First Congregational United Church of Christ Lake Geneva.